Since its opening in 1829 Wetherby Methodist Church has had a fascinating history alongside that of the church nationally and in partnership with the local community. From an early involvement in education and through two World Wars it has strived to serve the people in the area. It has changed a great deal in this time and its most recent history has involved two major redevelopments. The first one took place at the beginning of the 1980’s which led to the creation of the Joseph Rank Hall. 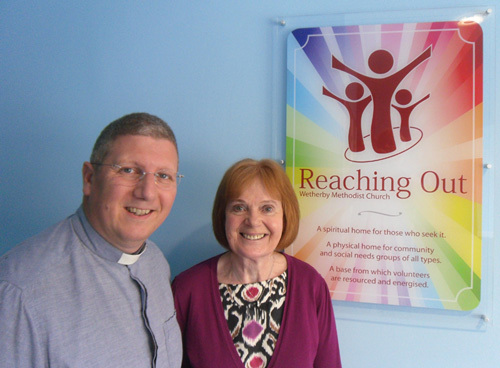 Twelve years ago we were delighted to welcome Steve as our Minister and under his leadership the Church again underwent a major redevelopment programme resulting in the creation of a beautiful Chapel with comfortable chairs, a Quiet Room, Upper Room, Link Corridor and modern facilities suitable for our less able users. It is now over four years since we finished our refurbishment and our re-designed premises have proved to be a great resource in helping us to reach out into the community. We have many new bookings and it has been a joy to provide a space that the community enjoy using as well as a spiritual home for those who wish to worship within our walls. If you are a new visitor to our website why not also visit our Church. We would love to meet you, or hear from you so that we can listen to one another’s stories and share in fellowship.